Anyone worth their weight in Pradas know the most covetable magazine issue to be seen in is the September issue of any glossy. Its like the Holy Grail or something… but anything Ms Anna Wintour can do, us Knutsfordians can do better right? 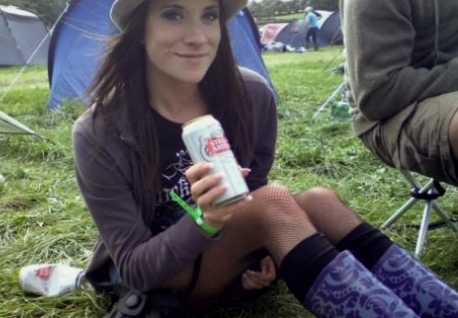 Victoria is definitely working festival chic a la Miss Moss with the boots, socks over fishnets, and the trilby not complete with the festival can of stella! It all rocks. Very “I’m with the band… don’t cha know”. Every month I will have a local “cover star” for this column. So keep yourselves looking suitably fashion forward because I’ll be snapping away on the streets of Knutsford and peeking through facebook. Now back to business, buying your new autumn/winter wardrobe is a bit like buying a new school uniform, would you agree? I tend to waltz in a store thinking “right this season, I want to channel Audrey Hepburn”… and tend to walk out channelling Gwen Stefani on a truly bad day. Who likes Harem Pants anyway? I’d love to know which genius bright spark though I know, woman need to have a baggy crotch area because it is uber flattering. No, we do not. Gwen, put yours away so the rest of us can stop living in fear. Steering us back to our winter uniform is shoulder pads…gasp? I nearly spat out my skinny latte. You know the saying “If you wore them first time, well you probably shouldn’t next time”. Luckily or should that be unluckily for me I was about 9 when they first entered the fashion circuit in the late eighties. So I can just about get away with it. But, I can’t. You see one of the downfalls of being quite tall and having quite broad shoulders is that you don’t want to broaden them anymore. As beautiful as the Balmain tuxedo is, it makes moi look like an extra from Sweeny Tod. Nevertheless on the more lithe amongst us it is a truly elegant piece and would look stunning teamed with just about anything. The High Street has their own versions of this from Debenhams to Warehouse, but my personal favourite is the Top Shop cropped sleeved with pin-stripe satin peeking through the sleeves, its tailored, versatile and a snip at just £55. Now this will take us straight through to Spring 2010 and at virtually zero cost per wear!